Encounter: Blue sharks, Makos, and off Catalina's shore line; Horn sharks and occasionally Angel sharks, swell sharks, Bat rays, and White sharks. There are two distinctly different styles of diving around Catalina Island. 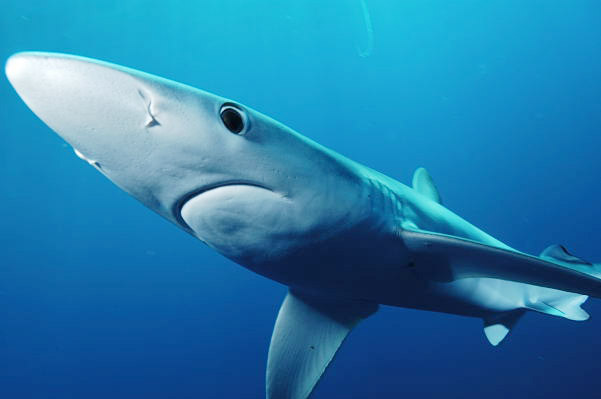 The first is an open ocean (blue water) encounter with Blue sharks and sometimes Mako sharks. In this environment the operator chums the waters consistently while floating along in the slick. Over two or three days, sharks slowly arrive for a while and then lose interest and are replaced by new sharks until the chumming stops. Its worth pointing out that this encounter is a shadow of its former self. Back in the 80's and early 90's it was not unreasonable to expect hundreds if not thousands of blue sharks to congregate around the boat. During this time of abundance divers would use cages and pro photographers or shark wranglers would wear chain mail suits to protect themselves from attack. 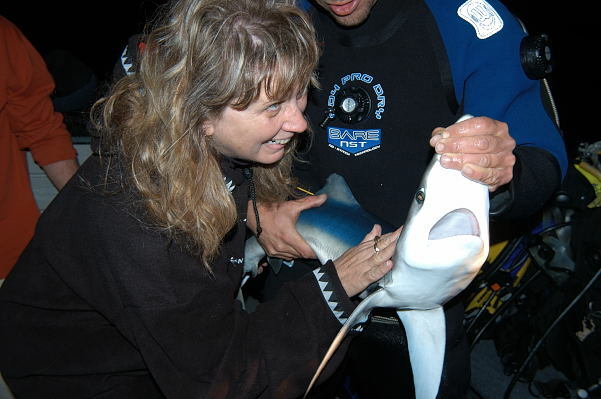 Now in the shark depleted 21st century, the encounters rarely yield more than a handful of sharks at one time and most of these are juveniles in the 2 to 5ft range. This is a sad fact of life that perhaps we can still correct in the future if a concerted effort is made to lobby for the protection of the remaining population. The way this encounter presently works is that a large surface cage is lowered over the side and divers not wishing to be directly exposed to any perceived danger, enter on snorkel and look down at the circling sharks. More intrepid divers are invited to hang on lines suspended from each corner of the hull. 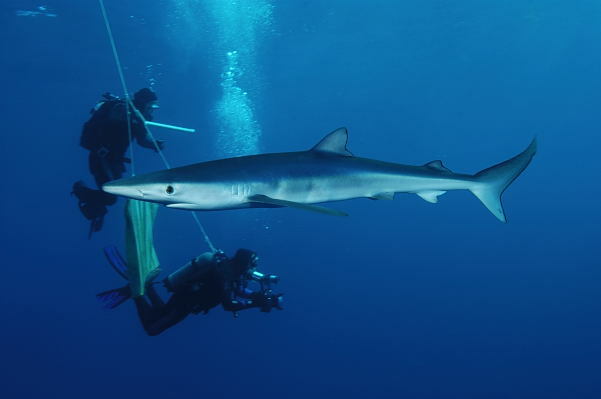 Each exposed diver is accompanied by a staff diver with a shark billy to deter unwanted attention. The divers are then free to focus on the sharks unhampered by the need to watch their backs. Makos sometimes materialize out of the blue to the delight of photographers. These fly bys are usually over in an instant but very occasionally a Mako will hang around and feed on the chum long enough for the divers to get a good look. 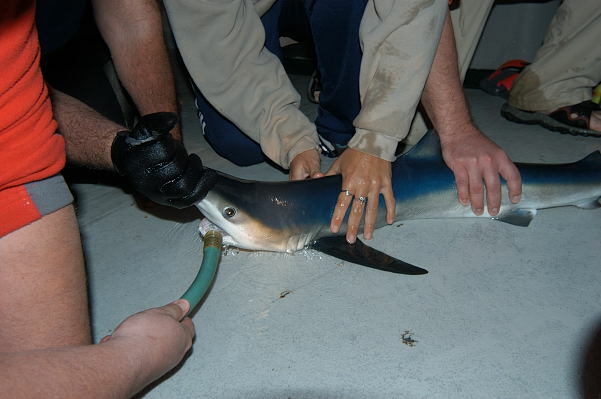 Part of the dive schedule includes the capture of one or two Blue sharks for tagging purposes. Interested divers are invited to participate and may be asked to help hold the thrashing sharks or even to insert the tags. After measurements have been taken the sharks are returned to the ocean to continue their journey. The second option around Catalina is to shore dive close to Avalon in search of Horn sharks. Juvenile horn sharks sit in depressions in the sand and are easily found at night. On an average dive you can expect to see at least 4 or 5 if you remain focused. Boat dives around the coast also sometimes yield Angel sharks although they are becoming harder and harder to find. Operators: The MV Aquatica leaves from Long Beach in LA. Its charter schedule is a bit erratic but generally when it is running it goes for the weekend to the far side of Catalina where boat traffic is at a minimum and no one can complain about the "danger" of chumming. Typically when the divers have had their fill of blue sharks the Aquatica runs into Avalon (on Catalina) for a last night of socializing in prep for the return voyage or if time permits, some reef diving the next morning before heading back to Long Beach. Local reef diving can be organized through Scuba luv in Avalon. Accommodation: The Aquatica is by no means a luxury vessel but she's sea worthy and the bunks are comfortable. Directions: Long Beach has a lot of marinas and finding the right one is a little tricky so if driving make sure you have a map and a cell phone handy to avoid missing the boat. Long Beach is just off the freeway south west of LA.